When the glow of pregnancy wears off and a constant stream of distractions claim your attention, it's easy to get sidetracked from the all-important role of Mom. Enter Shiny Things. Written by two moms who know that motherhood is most definitely not always buckets of rainbows and big bouquets of daisies-that real-life mothering calls for responsibility, intentionality, and a whole lot of sacrifice. This book examines the joys and difficulties that walk hand-in-hand with parenthood. It will help you evaluate what is truly important and show you how you can live out your calling as a mom, present and engaged. Just because motherhood is hard doesn't mean it's not also good, beautiful, and totally worthwhile. There will always be hard moments that will bring you to your knees, but there will also always be God. 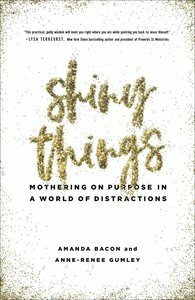 About "Shiny Things: Mothering on Purpose in a World of Distractions"